The M/V Incan Superior operated from 1974 to 1992, transporting newsprint pulp and occasionally other cargoes between Thunder Bay, Ontario and Superior, Wisconsin. The Incan Superior was a Canadian ship owned by Incan Ships, Ltd. and built by Burrard Dry Dock Company in North Vancouver, British Columbia. With twin propellors powered by twin General Motors diesel engines of 2,150 horsepower each, she was capable of reaching speeds of 30 knots, making her the fastest freight carrying ship on the Great Lakes. She was 373 feet long, 66 feet wide, with a gross tonnage of 3,838. The N scale model is 718 mm (25.28”) long and 125 mm (4.95”) in beam: In Z scale the model is 522 mm (20.56”) long and 90.9 mm (3.58”) in beam. It carries five tracks that feed a matching loading bridge ending with three tracks. The stern alignment has been slightly altered to move the switches entirely onto the bridge, rather than split the points and frogs between bridge and ship. By happenstance, the alignment is perfect for Atlas Code 55 No. 7 switches in N scale or the equivalent in Z. Longer or shorter switches can be easily accommodated by trimming the grooves at the stern. N scale Code 40 rail (not supplied with kits) fits into grooves on the deck that are wide enough for precise gauge adjustments. The Incan Superior gave the Canadian Pacific Railway (CP) a revenue stream from the growing paper industry. Large quantities of newsprint paper were needed in the U.S. Although Thunder Bay’s Great Lakes Paper Company was producing paper and pulp needed south of the Canadian border, CP had no direct rail route into Duluth or Superior to ship those products to the U.S. Instead of building a new railroad line CP created a direct rail-water link using a car ferry system between Thunder Bay and Superior. The CP handled the railroad switching chores in Thunder Bay, moving empty train cars off and placing loads back. The Lake Superior Terminal & Transfer Railway (LST&T or Terminal) in Superior performed the exact opposite task, taking the loaded cars off and replacing them with empties. The five tracks of the Incan Superior could carry up to 32 40-foot boxcars or 26 50-foot boxcars. Loaded cars carrying newsprint paper rolls would make the southbound trip from Thunder Bay to Superior; empty boxcars made the return trip from Superior to Thunder Bay. Chemical tanks cars and covered hopper carloads of grain and fertilizer occasionally made the trip as well, as newsprint revenue began to decline during the 1990s. Generally speaking it took about four hours for the railroad crews to unload and reload the vessel at either end of the trip. The Incan Superior usually left Thunder Bay at about 8 p.m., arriving in Superior pretty close to noon the following day. The slip that Incan Superior operated into in Superior was known during its day as the Incan Railcar Transfer Dock. Prior to that it was known as Berwind Fuel Company Dock No. 1, where bituminous and anthracite coal was off-loaded from ships and stored on the ground for railroad, industrial and home heating use. Today this location is known as Hallett Dock 8 located just west of the huge Midwest Energy Resources coal trans-loading facility. Historically, railroad tracks of the Terminal, Great Northern, and Burlington Northern have served this dock. The Incan Superior ended operations on Lake Superior on November 19, 1992. She had made 2,386 trips between the two Lake Superior cities. A competing land-based railroad route operated by Canadian National Railway became a less-expensive method of moving the same cargoes. A new U.S. federal tax was to go into affect, applied to each rail car carried over the water between the two countries by vessels such as the Incan Superior. The tax rendered the vessel unprofitable to operate, and the entire program was quickly abandoned. In November 1992 the Seaspan Costal Intermodal Company became the new owner of the Incan Superior. Seaspan brought her back to British Columbia, again via the long trip through the St. Lawrence Seaway and Panama Canal. Renamed the Princess Superior she began car ferry operations for CP in the Straits of Georgia, hauling rail cars and road vehicles between Vancouver and Nanaimo on Vancouver Island. Her seagoing bow was cut down to allow loading and unloading from either end of the ship. She continues in this type of service today. The Princess Superior will be available on September 1, 2018; the third ship of the class, the Princess Carrier will be available shortly thereafter. In the US the Incan Superior kit is $395 plus $30 shipping and handling. The accompanying Superior loading bridge is $49 when bought with the kit, and $69 plus $13 shipping and handling when purchased separately. Rail and railcars are not included; add $25 to purchase price for Code 40 rail. In the US, a completed ship is $975 with rails installed. A completed model of the loading bridge is $99 without track. Other options are available. Contact peterknolan@gmail.com. Payment via PayPal to peterknolan@gmail.com is preferred or other arrangements can be made. Wow Pete, whatta cool model! Hope you sell a bunch of 'em! Thanks, Bob. It's an extensively photographed ship with many changes over time, so there are lots of options in the details. For sticklers, the precise track arrangement at the stern is available. That entails putting the frogs on the ship and the points on the loading bridge. I'm not sure I would want to tackle this. I don't know about tides on the Great Lakes. The Superior loading bridge is usually seen level or on a slight upgrade to the ship. The loading bridge is wider because of moving the switches back, but I can live with it, especially on an operating railroad. I don't have room for turnaround loops on my new layout, so these kinds of ships may serve as the start and endpoint of a point to point scheme: the old loads in/empties out scenario. I've got plenty of linear space in a u-shaped attic, just not much width. (Lake Superior) "doesn't have tides like the ocean; however, periodically the water levels rise and fall by as much as one foot due to a phenomenon called a "seiche" (SAYSH, a French word that means "to sway back and forth"). This happens when water piles up on one side of the lake because of wind or high barometric pressure and then shifts back to the other side. Small seiches occur all the time, but sometimes strong ones can cause ships to bang together in harbors, or leave them high and dry for a few minutes." That is one beautiful hunk of boat. I wish it would have been available before I started the kitchen. Now seeking Pacific NW N scalers to create a Modutrak-style modular club featuring NP's shared mainline between Seattle and Portland. PM me if interested. Thanks! When I did research for my Lakers, I learned about seiches. A few years go by, and I forgot. Must be getting too old to hold these items in memory. This is a great model. And remember, you not only get a beautiful boat, but it comes with its own 32 car railroad yard. I used to travel on the Ann Arbor boats that ran between Frankfort Mi and Kewaunee WI during my college days in the early 1970s. Several times in the winter (which could be quite an adventure during a bad storm). Saw some of the switching ops pretty close up. The biggest variance in terms of the float apron, was the weight of the ship loaded vs. unloaded. The ferry modeled here carries 32 fully loaded 40' cars. Given that loaded weight of a boxcar is around 40-50 tons, you are looking at adding 1600 tons of more (keeping in mind that many of the cars are fully loaded with paper- per the description, and in a timeframe of heavier cars) to a ship with an empty weight (displacement) of 3800 tons. So fully loaded, the ship weighs 40-50% more than it weighs empty, and sits much lower in the water. As to tides- there are tides, but only about 2 inches- so indeed negligible compared to variations caused by wind and barometric pressure. Worst seiche I can remember- several feet- was sometime in the late 1970s, where the seawalls of some high rises near the beach in Chicago proved inadequate, caused their basement garages to flood, damaging tenants automobiles, knocked out power to those buildings and surrounding areas, and flooded parts of Sheridan road on the far north side. At the time I lived a block west and Lake Michigan was about 100 feet out my back door. It is also worth noting that the depth of the Great Lakes vary by year depending on annual precipitation in the watershed, and also vary a bit due to use of locks and dams in various locations for flood control and/or to assure adequate minimum levels for navigation in harbors, some rivers and the St Lawrence Seaway. I agree it is a handsome hunk. Rob Petersen suggested it to me about six months ago. 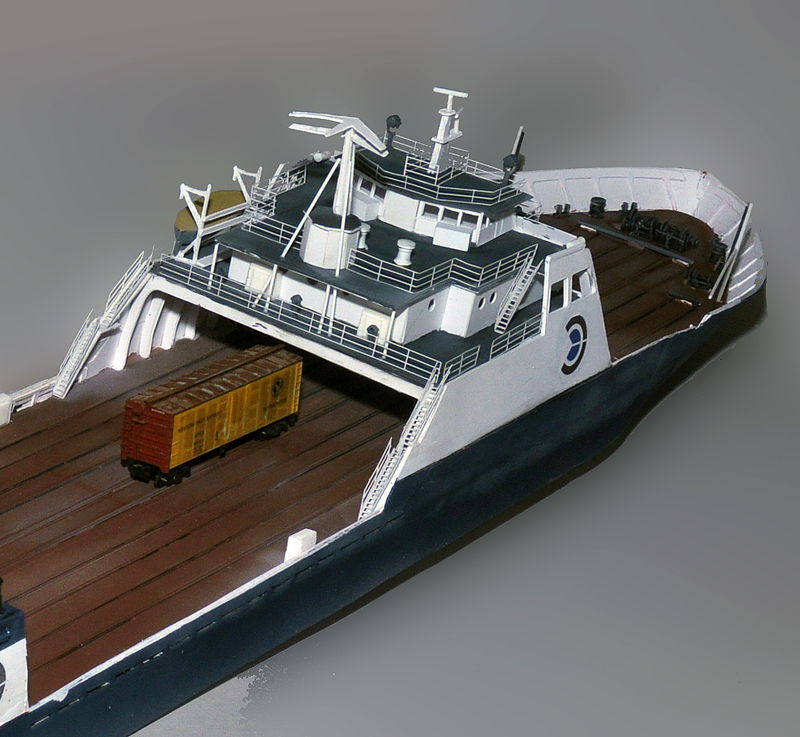 My second-ever N scale ship scratchbuilding effort in 1991 involved a fictional 450' car ferry with a flying bridge and split stacks at the stern of the boat. I had intended it for the Portsmouth Branch but that layout evolved very differently as a continuous run operation. So at Rob's suggestion I revisited the idea and really liked the lines and the size, which was almost exactly those of the 375' container ship. I thought, well, this will be a simple translation, 98.7% of length, 111% of width. I've learned time and again in the computer industry that simple translations are sometimes difficult and time-consuming. In the end, this hunk is now a straightforward build, as the hull form is simple and proven. It's been through constant modifications, which gives the modeler some choice and challenges for any specific year. Even with a perfectly stable lake level, a moveable bridge would still be needed, because the ship will change position as the cars are loaded/unloaded. Yes, you are adding about 3200 tons of cars to a deadweight tonnage of about 3550. Wow, thanks for the plug Peter! I hate to admit that I still haven't started this beauty, but hope to do so in the not so distant future. At one point you mentioned perhaps adding her sister ship the Carrier Princess to your lineup, I hate to report that she has been retired. I hope that wouldn't affect your decision as to whether you'll do so or not. At least she's basically the same hull, except for the front loading ramp, and of course the larger superstructure. Again, thanks for the superb model. It's interesting that this was the second time I've asked a question about a modeling subject to the right person and had the model come to fruition. At the National N Scale Enthusiast convention in June 2015 in Sacramento, I met Dan Huberman of Pacific Rail Services and asked him half jokingly when he'd offer the cars for the MRL Gas Local train, when he saw some photos and videos he was hooked and by the time I left his table he already had Fox Valley models onboard to produce the SD70ACe's for the set, and by the National Train Show in Portland that August the official announcement that the set was coming was made. I bought the first two sets. One is stored to be offered for sale at some point in the future, still sealed. Pete, that model is gorgeous. I must say each time you announce a new vessel to your lineup, it makes me wish I had a need for any of them. But this one, she's downright beautiful. Amazing work and kit and thanks for the historical anecdotes. Just amazing. The Carrier Princess is nearly ready to go. After Kay's death I found I nice new place but it will require some work to finish the workshop, which will be very large. I will be back up on a limited basis late next week.